1) Place your hand on a piece of color paper and trace out the lines with a pencil. Once you’re done, cut it out and place it aside. 2) Create the flower body, you will need to cut 3 x Green TiPs in half (sideways). You will only need 1 x half TiP for the flower body. 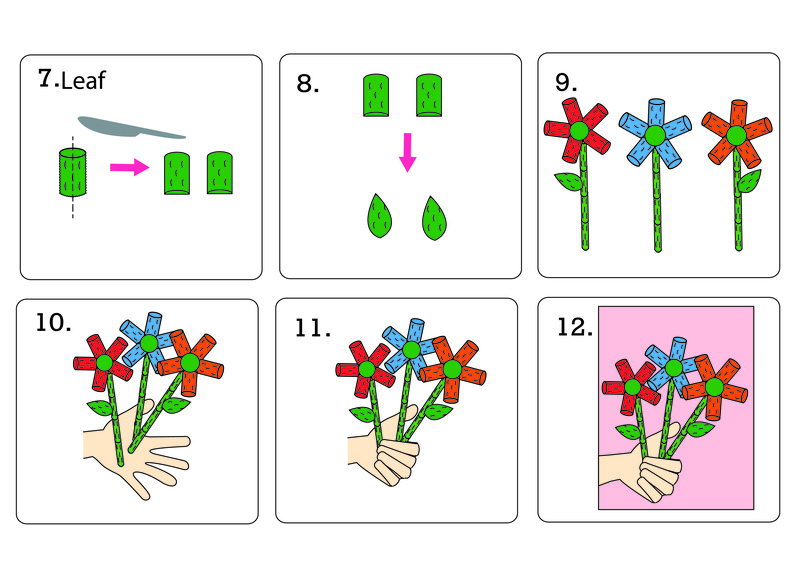 4) You will need to build 3 full flowers altogether. 5) For the flower stem, cut 2 x Green TiPs in half (top to bottom). Therefore you’ll have 4 x half of Green TiPs. 6) Twist the half cut TiPs into long and thin pieces. 1 stem consists of 4 x half cut TiPs. Attach them together from top to bottom to create a long stem. 7) To create the leaves, take 3 x TiPs and cut them in half (from top to bottom) – To make 3 flowers. 8) With each of the cut TiPs, gently squeeze and shape the top of the TiP to form a pointy end. Do the same for all half cut TiPs. 9) For the flower parts combination, attach the flower (petal & body), stem and leafs together as shown in the guide. 10) Place all 3 combined flowers onto the color paper shaped hand that you’ve cut out in step 1 and attach them as shown. 11) Pull the fingers back to the middle and stick them together so the hand is holding the flowers. 12) Finally, attach the hand and the flowers onto a separate sheet of art paper (A4 sized). Congratulations! 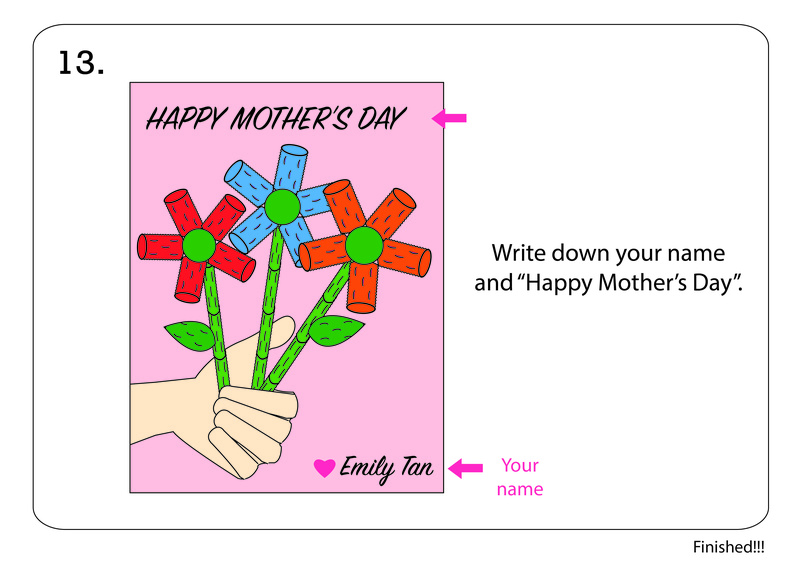 You have completed your very own Mother’s Day card! 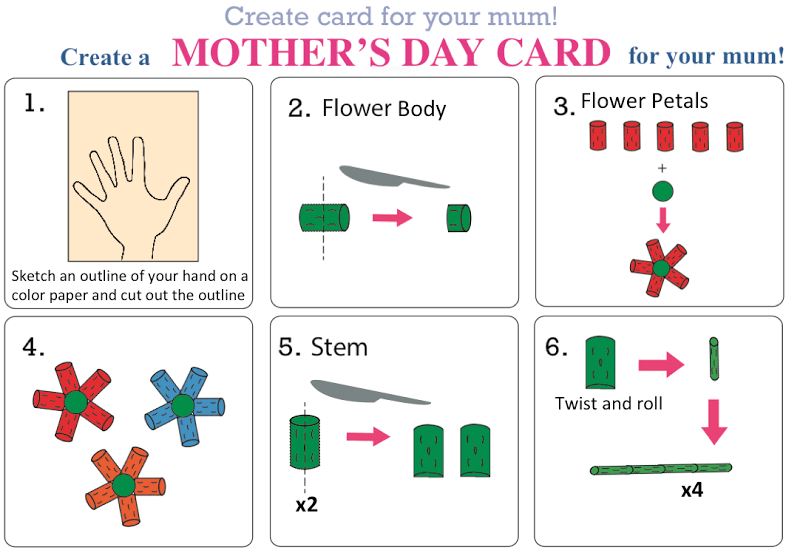 Your mum will be utterly surprised by your special card that you have made! To purchase our products, shop with us at Lazada (http://www.lazada.com.my/brain-bytes/) and 11Street (http://goo.gl/e3Pwnh). Hit LIKE on our Facebook page Brain Bytes (https://www.facebook.com/BrainBytes/) for more info and updates.